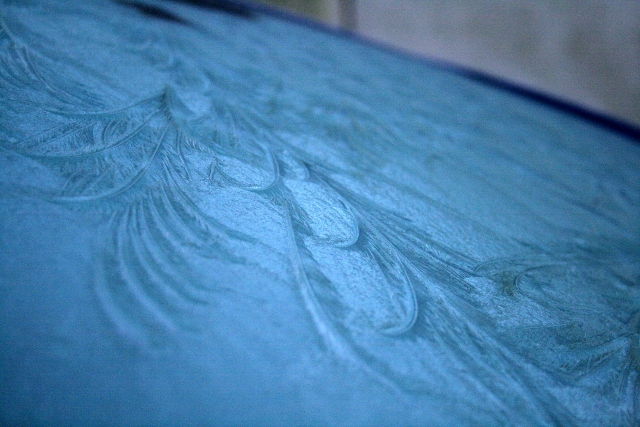 Ice on car windscreen in Woodingdean. We are now into overtime. The first frosty start of the dig. 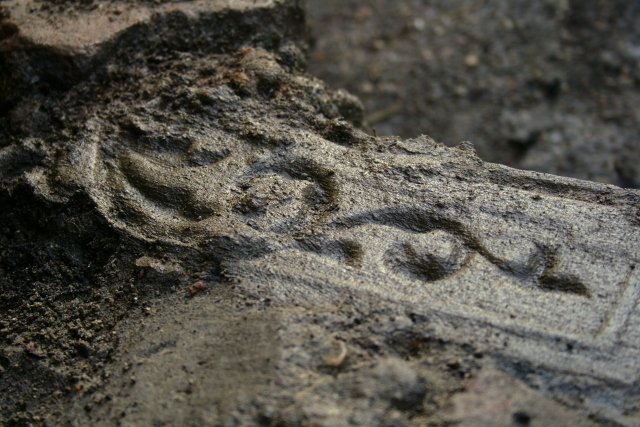 Interesting to note, whilst the puddles on the way to the dig site were covered in ice, those on the dig site itself were not – an indication of how sheltered the cottage must have been. Panorama from S bank of dew pond on Newmarket Hill, looking E to W; click to enlarge. Fortunately for us, the day remained beautiful and sunny, though the long term forecast is for more rain. Cloudy (wet) weather acts as a warm blanket which prevents heat loss at night so less danger from frost, but for the laser scan, dry weather is definitely required. I am therefore keeping a very close eye on long term forecasts. Looking NW at junction between N & S rooms of cottage. 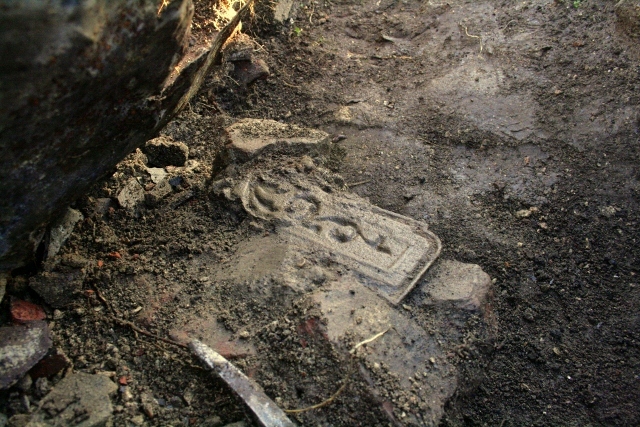 The image above shows the original floor level of the inside of the cottage. It was proposed that to better understand the construction of the cottage I should consider using the original units of measurement used by the builders. Therefore, to record the extent that military ordnance and the later bulldozer formed the observed cut through the wall and floor remains, I choose to use brick courses as a relative unit of measurement. 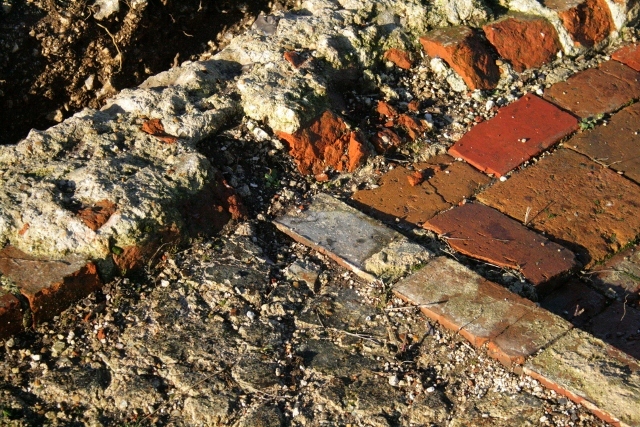 The mortared flints were also laid in courses level with the bricks on either side, at least within the cottage. 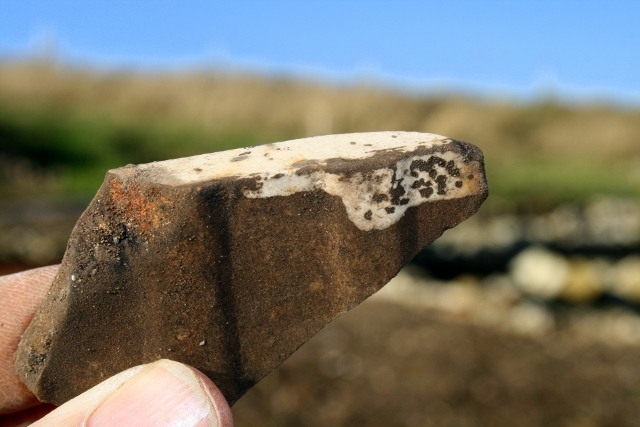 Each course of flints was delineated by double struck lines in the mortar, making these courses easy to observe. 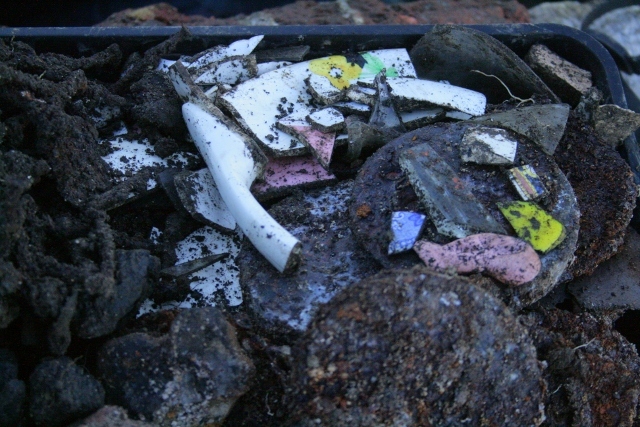 Collage of photos looking N at remains of internal dividing cottage wall; click to enlarge. The image above consists of a series photos of the internal dividing wall of the cottage. Careful observation revealed that the bulldozer cut was at an angle roughly parallel with the surrounding ground surface, and that its eastern side was five bricks courses below the original floor level. Furthermore, the eastern cut face of the outside wall at this point was about six courses above the original ground level. 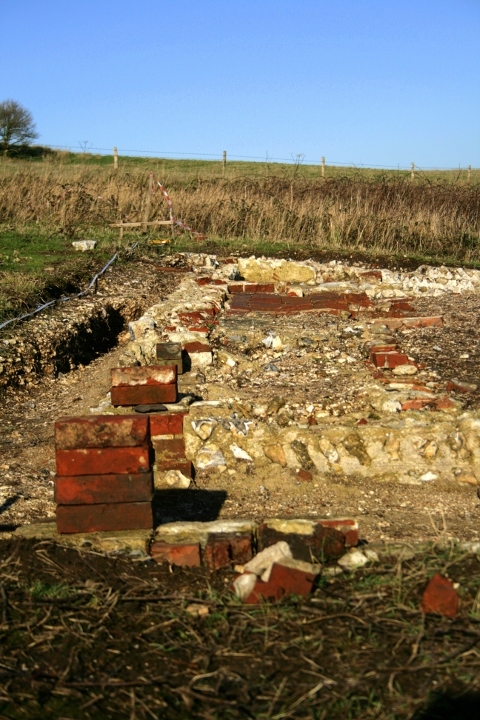 Thus, when the cottage was built, its western end may have been cut into the chalk bedrock, whilst its western end was raised well above the original ground surface by back-filled chalk rubble, about ten courses above the eastern ground level (approximately three feet in height). Looking N at W side of cottage with bricks to indicate approx height of floor level. 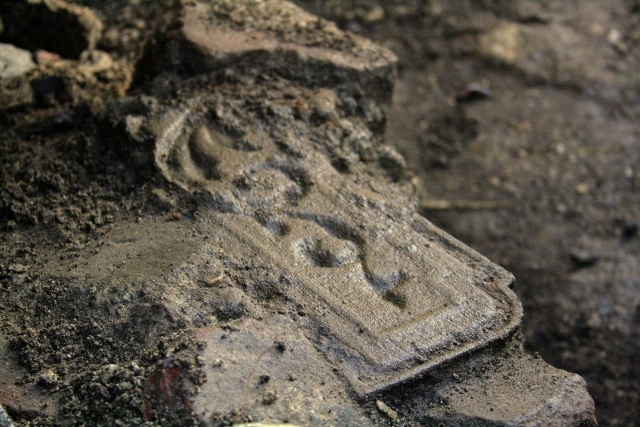 Recording/surveying the south-west corner of the cottage’s extension showed it was five brick courses lower than the surviving floor level further north. Military ordnance and/or the later bulldozer clearly cut very deep into its foundations here, which helps explain why the extension’s east end has been completely lost. Looking SW at E side of cottage. 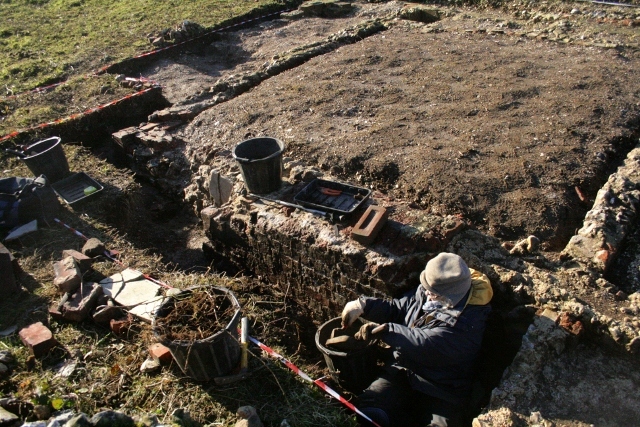 Looking S at trench E of chimney base. 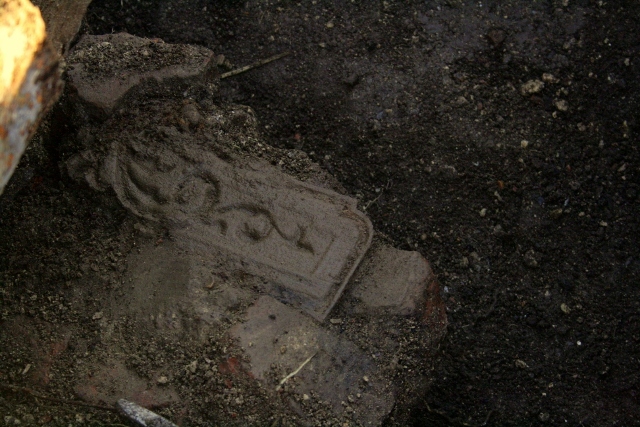 The east side of the trench down beside the base of the chimney was further excavated, down through a deep layer of demolition rubble and into one of the cottage’s many middens, which had a distinctly musty smell. 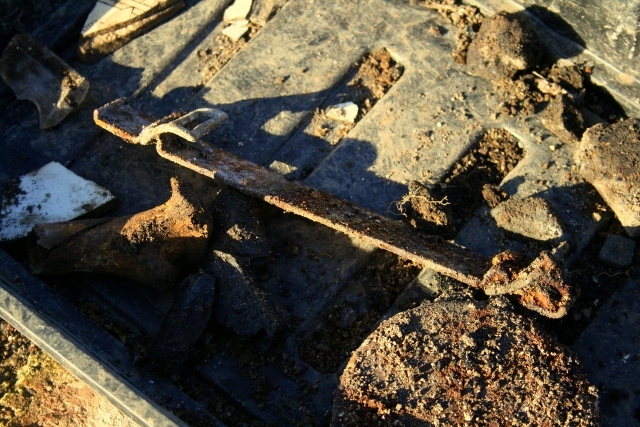 Finds tray containing a metal ammunition box(?) handle attachment. The small plastic (PVC?, post 1926?) 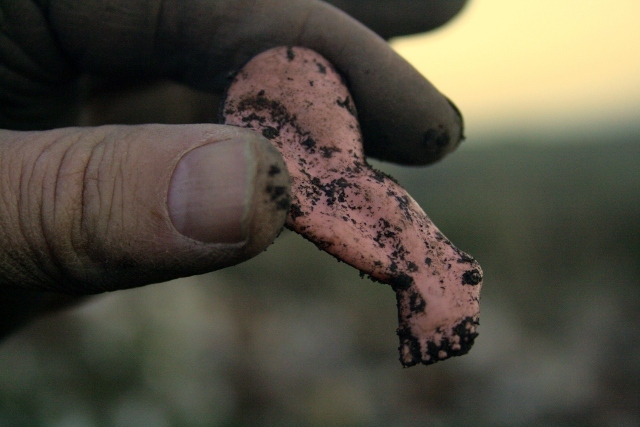 leg of a doll, identical to one found earlier. 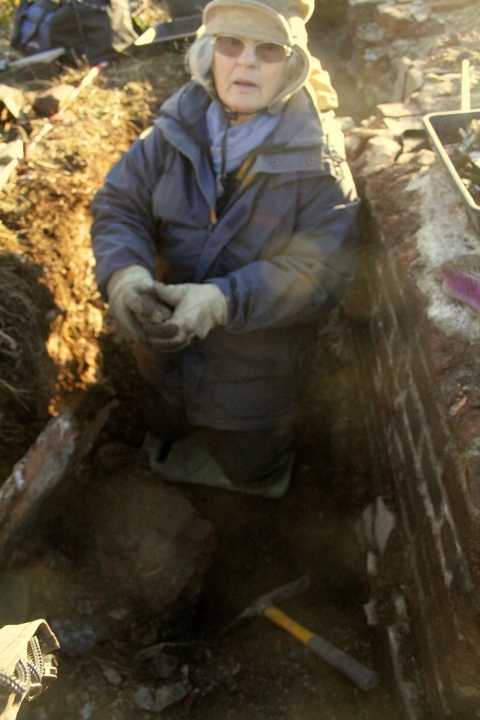 Meanwhile I am busy preparing for a talk about the dig on Friday 10th January. It is at the Woodingdean Holy Cross Church Hall, at 7-30pm. 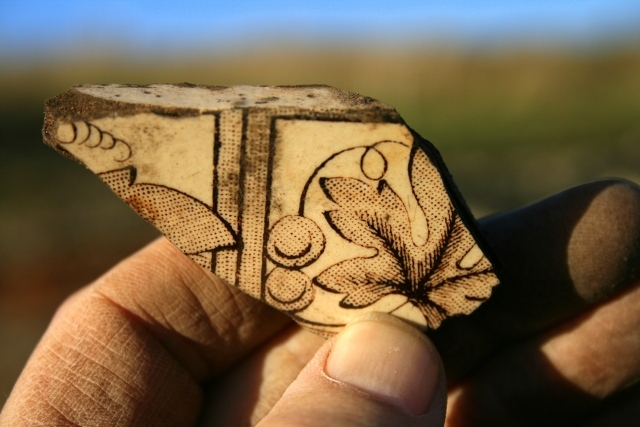 Twelve historical objects and key dig finds will be used to illustrate the story of what we have discovered of the origins of Newmarket Farm, and the lives of those who lived there. Whilst we wait for a window in the weather guaranteed to be dry for the 3d laser scan, there are still plenty of opportunities to dig. 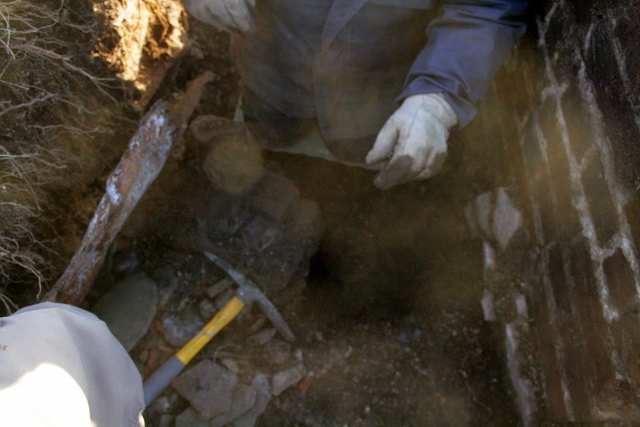 We would love you to join us – either for a site visit, or to help us dig – no experience required! We meet at the car park near the junction of Bexhill Road and Falmer Road, just north of Woodingdean.